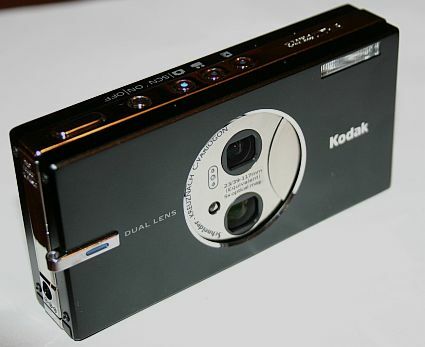 Kodak has introduced a digital compactcamera. It incorporates Retina dual lens technology to offer 5x optical zoom within nonextending lenses on a 8.0-inch thick camera body. The V570's top lens has an ultra wide angle of 23mm and a wide f/2.8 aperture. The lens delivers a standard 'fisheye' effect, but users can allow or disable this with the V570's distortion correction technology. The camera has a 2.5-inch LCD screen with 230 000 pixels and 32MB internal memory, which can be expanded with SD memory cards. 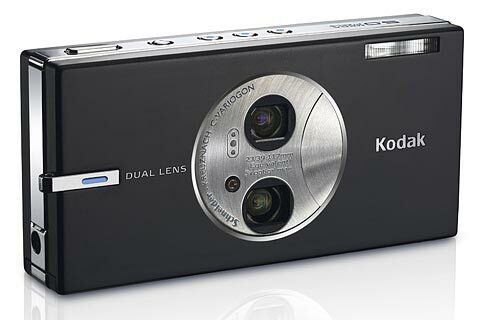 It can shoot video at 30 frames per second with digital image stabilization and still use the optical zoom.